Deadline to remove winter decorations at Woodsdale Cemetery. Leetonia High School Class of 1966, 12:45 p.m., Heck’s Restaurant. St. Patrick Catholic Church pierogi sale, 1-3 p.m., $6 per dozen; for types and orders call Suzanne Tobuck from 9 a.m.-6 p.m. at 260-458-7147. Toddler and Preschool Story time, 10 a.m., Lepper Library; for children ages 5 and under. David Anderson High School Class of 1956, 11 a.m., Belleria. Salem High School Class of 1949, breakfast, 9:30 a.m., Adele’s Place. Salem High School Class of 1956, 11:30 a.m., Mike’s Penn Ave Grille. Salem school board Cirriculum Committee, 11:30 a.m., administration office. Goshen High School Class of 1958, noon, Annabell’s Restaurant; classmates may invite guests. Salem High School Class of 1965, dinner, 6 p.m., back room, Ricky’s English Pub. Wellness Wednesday featuring reflexology, 6:30 p.m., Salem Public Library Quaker Room; register, www.salem.lib.oh.us or 330-332-0042. Blood pressure screening by Salem Area Visiting Nurse Association, 1-2 p.m., Sebring Library. Salem United Commercial Travelers, Council #590, 6:30 p.m., Perkins Restaurant; business session immediately to follow dinner. Senior Moments Cafe canceled. Will resume in September. Kaiser and National retirees, 8:30 a.m., Adele’s Place. Elkton Fairfield Homemakers, 10 a.m., Southern Terrace Park; Achievement Day. Oasis Food Ministry food distribution, 4-6 p.m., First Christian Church, 39 Cherry St.
United High School Class of 1965, lunch, noon, Mark’s Landing. Drive-thru Chicken Dinner, 3-6 p.m. (or until sold out), Calvary United Methodist Church, 12062 South Ave.; $7; menu, stuffed chicken breast, mashed potatoes, gravy, green beans and a brownie; reserve a dinner by calling 330-549-2588. Salem TOPS 1598, 8:30 a.m. weigh-in, 9 :30 a.m. meeting, First United Methodist Church. Salem Community Food Pantry, 4-7 p.m., 794 E. Third St.; distribution ends at 6:45 p.m. Pistol League, 6 p.m., Salem Hunting Club. Something Special, 11 a.m., Sebring Library; stories, fingerplays and music for children ages 3-5 accompanied by an adult. Lego My Library, 4 p.m., Sebring Library; Legos provided; for children ages 6 and up. Washingtonville VFW Post nominations/elections, 6 p.m.
Angels for Animals Gigantic Garage Sale, early bird sales, 9 a.m. to noon, wristbands at 7 a.m., $10 admission; public sale, noon to 5 p.m., $2 admission; Canfield Fairgrounds. Tree Planting and Restoration Workshop, 9 a.m.-3 p.m., Beaver Creek Wildlife Education Center; meet at the center from 9 a.m.-noon then travel to Hellbender Bluff for demonstrations; register at beavercreekw@aol.com. Second Harvest Food Distribution, 9:30-11:30 a.m., Bunker Hill United Methodist Church, 15096 W. Middletown Road. Fish Fry, 4-7 p.m., Guilford Lake Ruritan Club on Hanna Drive and state Route 172; $10 adults. Fish Fry, 5-8 p.m., Italian American Social Club, 202 Main St.; open to public with a children’s menu and carryout; information, 330-427-9900. Columbiana County Department of Job and Family Services (CCDJFS) Senior Citizens Services Levy Advsiory Board, 8 a.m., CCDJFS second floor director’s conference room, 7989 Dickey Drive Suite 2. “Saving Salina,” Stage Left Youth Players Krill Cast, 7 p.m., Trinity Playhouse, 234 E. Lincoln Way; $14 for adults, $12 for seniors and $10 for students; tickets available at StageLeftPlayers.org. Lent fish fry, 4-7 p.m., Salem Eagles; chicken dinner $8, fish dinner $10; carryout 330-337-8053; “Simply the Deals” auction 6 p.m. Fish Fry, carry out and limited seating, 4:30-7 p.m., Salem Saxon Club; $10 adults, $5 children; choice of fried fish, baked fish or bread pork chops, with scalloped potatoes, green beans, cole slaw or fruit, dinner roll and homemade cake; cash bar open while waiting. Active Shooter program, 6 p.m., Salem Public Library; Salem Detective Brad Davis teaching tactics to help survive an attack; for adults; register salem.lib.oh.us or 330-332-0042. .22 Rifle Matches, 6 p.m., Salem Hunting Club. Fish fry, 4-7 p.m., Beaver Creek Sportsman Club, 14480 Washingtonville Road; beer battered haddock or shrimp dinner, $12 for adults, $7 for 10 and under; carryouts, 234-320-8187. Fish fry, 4-7:30 p.m., VFW Post 5532, carryouts available, call 330-427-2533. Beaver Ruritan All-You-Can-Eat Fish Fry, noon-6 p.m., South Range School Cafeteria; $12 adults, $6 children 11 years and under; family style and carry out available; fish, French fries, green beans, coleslaw, rolls, drink and dessert; tickets available in advance from any Beaver Ruritan member or at the door. Angels for Animals Gigantic Garage Sale, 10 a.m. to 5 p.m., $2 admission; Canfield Fairgrounds. 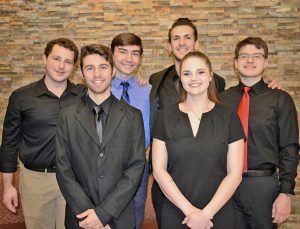 Concert featuring the Needhams, 6:30 p.m., Carrollton Bible Chapel, 365 Steubenville Road S.E. ; love offering will be collected; two canned goods are requested for admission, to be donated to the local food pantry Loaves and Fishes; information, 330-627-7376, 330-323-9253 or 330-323-5610. Rabies Clinic, 1-4 p.m., Damascus Fire Department meeting room; $8 per animal; all dogs must be on leashes and all cats in cages; Damascus Ruritan Club will be collecting non-perishable food items. Swiss steak dinner , 4-7:30 p.m., East Rochester United Methodist Church, 24754 state Route 30. Includes slow roasted Swiss steak,mashed potatoes and gravy, green beans, coleslaw, applesauce, rolls, homestyle desserts and beverage. Cost is $10 for adults and $5 for children 10 and under. Dine-in or carry-out. May call ahead at 330-894-2515. Proceeds benefit the church and missions. Chicken and Biscuit Dinner, 4:30-6:30 p.m., Bunker Hill United Methodist Church, 15096 Middletown Road; $8 adults, $5 children ages 5-12, free children 4 years and under; menu, chicken with biscuit, gravy, mashed potatoes, glazed carrots, applesauce or coleslaw, cake and coffee or punch; carry out available; bake sale will also be held; information, 234-575-1099 or www.bunkerhillumc.net. United High School Class of 1966, 8 a.m., Avalon Restaurant. United Local Show Choir Festival, 6:30 p.m., auditorium; $5. Saturday Storytime; 11 a.m., Lepper Library; camping theme; for ages 3-8. All you can eat community breakfast, 7:30-11 a.m., North Benton Presbyterian Church; $6.50 adults, $3.50 children ages 6-12, free for children 5 years and under; carryouts available. Haystack Breakfast, 7-11 a.m., Salem Eagles; haystacks, traditional, waffle or pancakes; $6; carry out 330-337-8053. CCW Class, 8 a.m.-5:30 p.m., Salem Hunting Club; register, 330-831-9847. Salem High School Class of 1958, breakfast, 9 a.m., Adele’s. Downtown Spring Clean-Up, 9 a.m.-noon. Individuals, businesses and organizations are requested to meet at McCulloch Park at 9 a.m. to receive assignments. Volunteers are asked to bring brooms, dust pans, gloves, leaf blowers, rakes, wheelbarrows and related items. Personal items should be marked. Salem Second Saturday, “Smart in Salem” activities with Downtown Salem, 10 a.m. to 1 p.m.; encourage learning, buy a book at the Salem Historical Society gift shop, 239 S. Lundy Ave.
Open house, 10 a.m.-2 p.m., Salem High School Alumni Association. Salem High School Class of 1953, noon, Annabell’s Restaurant. Salem High School Class of 1957, lunch, noon, Boneshakers. For information call 330-424-2239 or 330-337-9835. Salem High School Class of 1959, noon, Coaches Burger Bar Salem. Spa Day, 1-4 p.m., Reach for the STARS, 440 E. State St.; $20; tickets at Reach for the STARS, Columbiana County Educational Service Center or Liebe Wein; information, 330-853-5721 or Reach for the STARS on Facebook. Angels for Animals Gigantic Garage Sale, 10 a.m.-3 p.m., free admission, all items 50 percent off; 3:15-5 p.m., all items priced $10 for all you can take, free admission; Canfield Fairgrounds. Tractor-Wagon Rides, 1-4 p.m., MetroParks Farms; craft fee $1; barns open to visit animals; information, 330-533-7572. Public breakfast, 7 to 10 a.m., American Legion; haystacks and hobo omelets; $5. “Saving Salina,” Stage Left Youth Players Krill Cast, 2 p.m., Trinity Playhouse, 234 E. Lincoln Way; $14 for adults, $12 for seniors and $10 for students; tickets available at StageLeftPlayers.org. Salem VFW Post 892 Auxiliary public breakfast, 8-11 a.m., post home, 496 Arch St.; $5; haystacks or traditional breakfast consisting of eggs, pancakes, hash browns, sausage patties, toast, orange juice and coffee. Model Railroad & Toy Train Flea Market, 10 a.m.-3:30 p.m., Salem Center Plex, 1098 N. Ellsworth Ave.; admission $5 per person; information: www.ymra.org. Salem High School Class of 1969, 12:30 p.m., BB Rooners.